The tri-tip is a cut of beef from the bottom sirloin primal cut. It is a small triangular muscle, usually 1.5 to 2.5 lbs. per side of beef. In the United States, this cut was typically used for ground beef or sliced into steaks until the late 1950s, when it became a local specialty in Santa Maria, California, rubbed with salt, pepper, garlic salt, and other seasonings, cooked over red oak wood and roasted whole on a rotisserie, smoked in a pit, baked in an oven, grilled, or braised by putting a pot on top of a grill, browning the meat directly on the grill surface before and after the braising. (The tri-tip is still often labeled the "Santa Maria steak".) Most popular in the Central Coast of California and Central Valley regions of California, it has begun to enjoy increasing popularity elsewhere for its full flavor, lower fat content, and comparatively lower cost. President Reagan often had Tri-Tips flown into Washington for special gatherings. 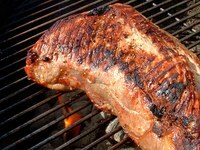 An even better history of tri-tip can be found on Susie Q's Santa Maria Style BBQ. Continue reading Santa Maria Tri-Tip.